I live for the day when heirloom tomatoes appear at the farmers market. 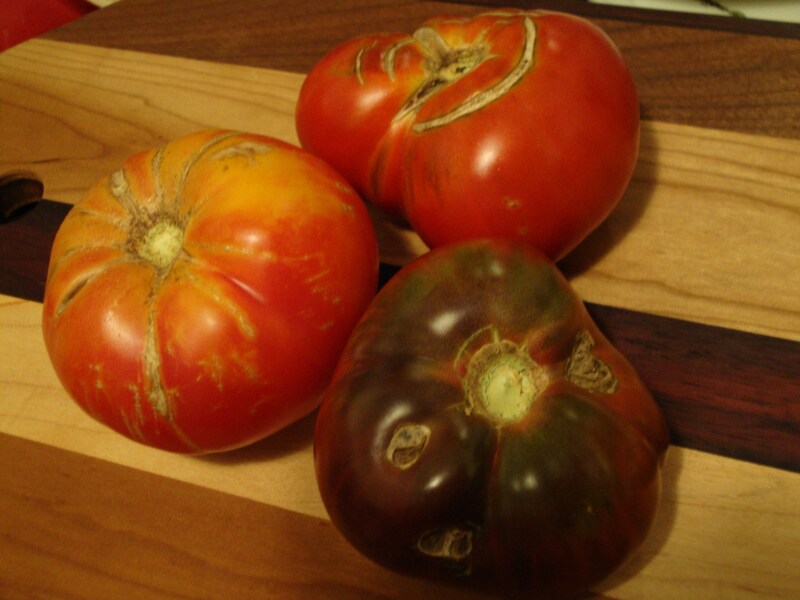 I’m a bit of a tomato fiend — I’m sorry, but a sandwich is just not a sandwich without tomato — but nothing beats a fresh, local, funky-looking heirloom tomato. I love them so much that I spent $12 on them at the farmers market. And it will be worth every penny, believe me! 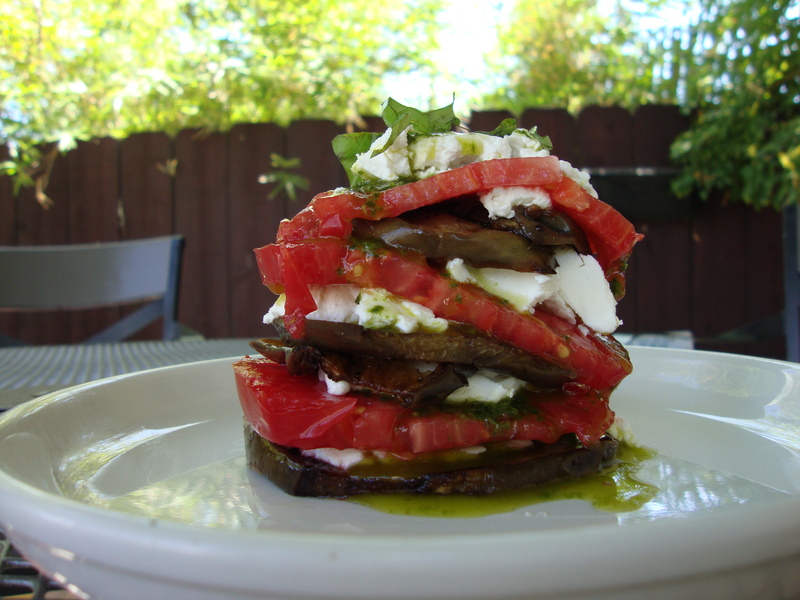 My go-to with an heirloom is a simple caprese salad with fresh mozzarella, but this week I found a delicious-looking recipe for Eggplant, Tomato, and Feta Cheese Napoleans (courtesy of Emeril). Um, yes please! Eggplant is one of my favorite vegetables, and I found some adorable little purple and white specimens at Whole Foods that I couldn’t pass up. Roasted with balsamic vinegar and stacked with goat cheese, tomatoes and basil oil…oh wow. Not only does it look impressive, I think I could eat this for every meal this week. I opted for goat cheese instead of feta — good choice, if I don’t say so myself. Seriously — how amazing does that look? I outdid myself on this one. To make the pesto oil, pulse the basil and garlic in a food processor or blender until finely chopped. With the machine running, add the olive oil in a steady stream and process until well blended. Season with the salt and pepper. Transfer to a bowl and cover tightly. To make the napoleons, preheat the oven to 450°F. Cut the eggplant crosswise into 12 slices about 1/4 inch thick. Mix 1/4 cup of the olive oil and the balsamic vinegar in a large bowl. Add the eggplant slices and toss to coat. Season with the salt and pepper. Place the eggplant on a baking sheet in one layer and bake until soft, turning once, about 15 minutes. Let cool. In a small bowl, combine the cheese, basil, and the remaining 1 tablespoon of olive oil. Slice each tomato crosswise into 4 slices about 1/3 inch thick. Place 1 eggplant slice on a salad plate. Top with about 1 tablespoon of the cheese mixture, then a tomato slice. Drizzle 1 teaspoon of pesto oil over the tomato, then top with another tablespoon of cheese. Repeat with an other eggplant slice, 1 tablespoon cheese, a tomato slice, and 1 teaspoon pesto oil. Finish with a final eggplant slice, another tablespoon of cheese, and a drizzle of pesto oil. Repeat with the remaining ingredients. Serve at room temperature, with pesto oil drizzled around each napoleon. This entry was posted in Recipes, Uncategorized and tagged eggplant, goat cheese, recipe, tomato, veggies by Tricia. Bookmark the permalink.